Reports of a New Year jobs cull at Jaguar Land Rover (JRL) underline the scale of the challenge facing Britain’s biggest carmaker. JLR has not confirmed the stories, which first appeared in the Financial Times. But, then again, it hasn’t denied them either. According to JLR, speculation that up to 5,000 jobs may be at risk is just that – “media speculation”. Signs of trouble have been brewing all year. JLR made a pre-tax loss of £90m for the three months to end of September, compared to a profit for the same quarter in 2017. The firm’s Solihull plant, where it makes Range Rover and Jaguar models, was closed for a two-week shutdown due to “fluctuating demand”. 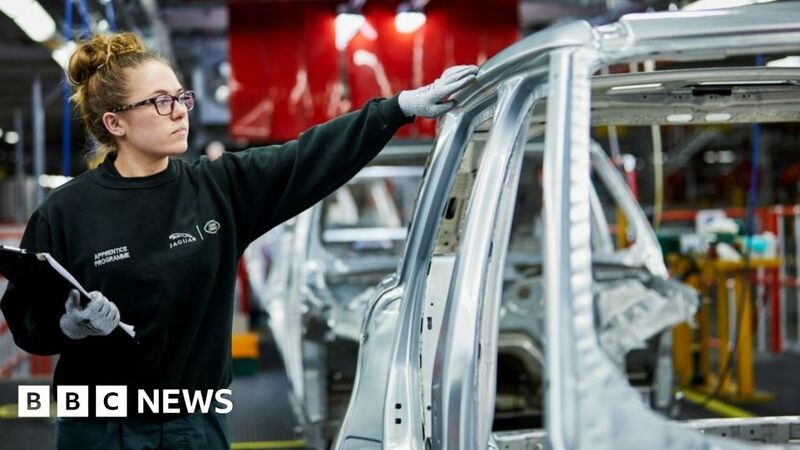 That followed a move to a three-day week at JLR’s Castle Bromwich plant. Professor Bailey says JLR is caught in a “perfect storm” – the threat of a no-deal Brexit, slowing growth in China and a fall in diesel sales. Most analysts agree that the jewel in Britain’s manufacturing crown needs more than just a polish. So a big cut in the 40,000-strong workforce, though painful, wouldn’t be too much of a surprise. Falling sales in China is arguably the single biggest cause of JLR’s current woes. The world’s biggest car market has been driving growth for years, not just for JLR but for the global industry. A year or two ago things were still looking so positive. China accounted for about 25% of JLR sales and the company was building up production at plants in the country to help feed that growth. The Chinese love British luxury goods, went the marketing hype. And JLR said it was perfectly positioned to cash in on the consumers’ love of big brands. But the market has stalled. A economic slowdown has made consumers more cautious about buying big ticket items. Beijing has scrapped some tax breaks on new cars, and rises petrol prices has hurt sales of fuel-thirsty sport utility vehicles. All this came against a backdrop of trade war talk and uncertainty about stiffer tariffs on cars. In fact, the latest speculation is that China will cut import tariffs but that may delay some purchases in the hope that prices will fall. The scale of China’s slowing market was evident last month, when total car sales fell 14% from a year earlier, marking the steepest such drop in nearly seven years. The China Association of Automobile Manufacturers (CAAM) said 2.55 million vehicles were sold, a fifth straight monthly decline. The November fall comes after almost 12% declines in each of the past two months, putting China on track for an annual sales contraction not seen since at least 1990. “We’re currently in a painful period, and this process is really tough,” Xu Haidong, CAAM’s assistant secretary general told a press conference when the figures were released. JLR has not been immune to this slowdown. In November, its sales in China were 50% lower than a year ago at 6,804. Sales in October fell 46% year-on-year. It hasn’t helped that JLR is understood to currently have a fraught relationship with car dealers in the country, who want the company to put up more money to help subsidise sales promotions. Some of JLR’s rivals are doing it, but the company has been reluctant to follow. Outside China, JLR also continues to struggle, although the problem is no means as acute. Overall sales in the three months to September fell by 13%, with all its key regions seeing a slowdown. But JLR is not entirely the victim of circumstances outside its control. The company has been criticised for not starting the shift away from diesel earlier. Almost 90% of sales last year in Britain, its largest market, were diesels. Other critics say there is too much overlap between models, such as the Range Rover Velar and Range Rover Sport. Also, Professor Ferdinand Dudenhöffer, from the Center for Automotive Research, at Germany’s University of Duisberg-Essen, says Jaguar probably has too many models to compete with its rivals. Jaguar sold 180,000 cars last year, broadly the equivalent of 30,000 per model. “You cannot compete with BMW or Mercedes with just 30,000 sales per model,” he said. Both BMW and Mercedes have this year issued stark warnings about the slowdown in China and falls in diesel sales. But both companies remain profitable, sustained by a global manufacturing base and bigger sales footprint. Basically, says the professor, the problem for JLR is that it makes too many big cars that run on diesel. “JLR needs a more balanced portfolio in order to compete under new emissions rules. But the company must move with more speed,” he said. The current restructuring plan includes reducing investment and taking out inventory. JLR’s chief executive Ralf Speth said it would “lay the foundations for long-term sustainable, profitable growth”. But there is another hurdle that could yet de-rail this restructuring, one that prof Dudenhöffer says outweighs all the other hurdles – a no-deal Brexit. Mr Speth has warned about the consequences for investment in the UK if there is a hard Brexit. And the professor says he was right to do so.